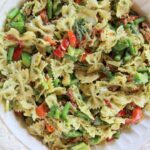 This colorful Pesto Pasta Salad has everything you could want: basil pesto, sundried tomatoes, asparagus, lemon zest…it’s overflowing with flavor and color and pizazz! You know you can’t resist a pasta salad with a name like that. It’s superb and has a unique balance of flavors that complement each other and really pop in your mouth. This may be my favorite pesto pasta salad ever! Pizza Pasta Salad – the easiest pasta salad! 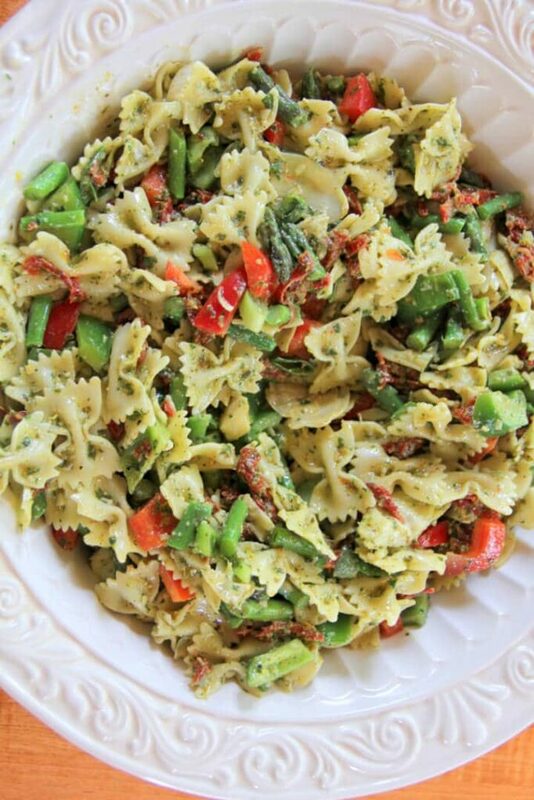 Lots of fresh spring bounty is included in this pesto pasta salad: asparagus, peppers, basil pesto, lemon zest, along with artichoke hearts and sundried tomatoes. With a mix of fresh and canned ingredients, this pasta salad does require some chopping–but it’s so worth the effort! Step 1. Start by blanching the asparagus for about 45 seconds. Pro tip: You should have a bowl of ice water ready so you can immediately plunge the asparagus into the ice water to stop the cooking process, and then immediately remove it from the ice water and drain well. Step 2. While the asparagus is cooling, cook the pasta according to package directions, drain it well and put it in a large bowl. Pro tip: Think outside the box: if you don’t have a large enough bowl to mix the pasta salad in, use something like the lid to your cake carrier–try this one if you don’t have one! Step 3. Once the asparagus has cooled, chop it into one inch pieces. Step 4. 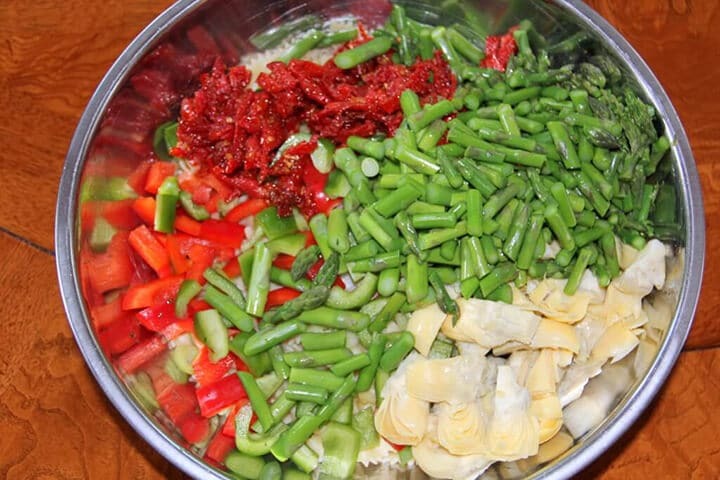 To the cooked pasta, add a can of drained artichoke hearts, sun-dried tomatoes, the chopped asparagus, and peppers. Step 5. 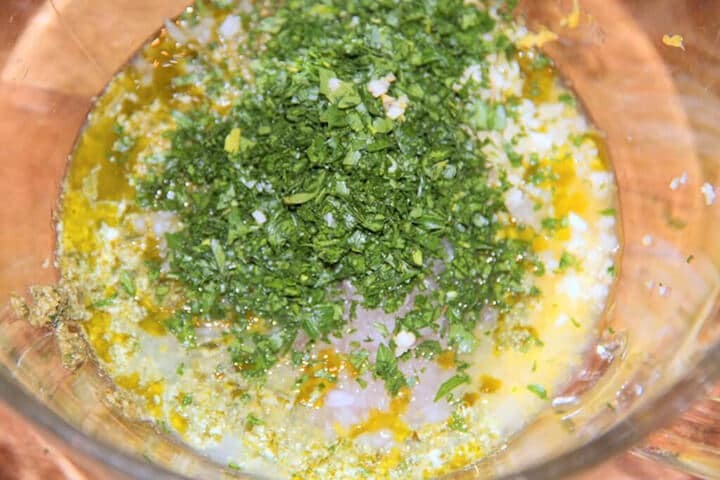 Make the lemon dressing: Add fresh lemon juice and zest to a cup of basil pesto, then mix in chopped shallot and garlic along with chopped parsley and about a tablespoon of olive oil. Whisk together until smooth and then stir into the pasta. This dressing is adapted from a Rachael Ray pesto pasta salad recipe and is so, so good. Voila! Try this Lemon Basil Pesto Pasta Salad for your Memorial Day party with Easy Baked Ribs or Brisket and you won’t be disappointed. And keep it on file for Christmas—with all the pretty red and green, every time I look at this dish I think of Christmas! A delicious, spring pesto pasta salad filled with vibrant colors and flavors. It works as a side or even as its own light summer lunch. Place all ingredients in a large bowl and whisk together until smooth. Cook pasta according to package directions. Drain and set aside in large bowl. 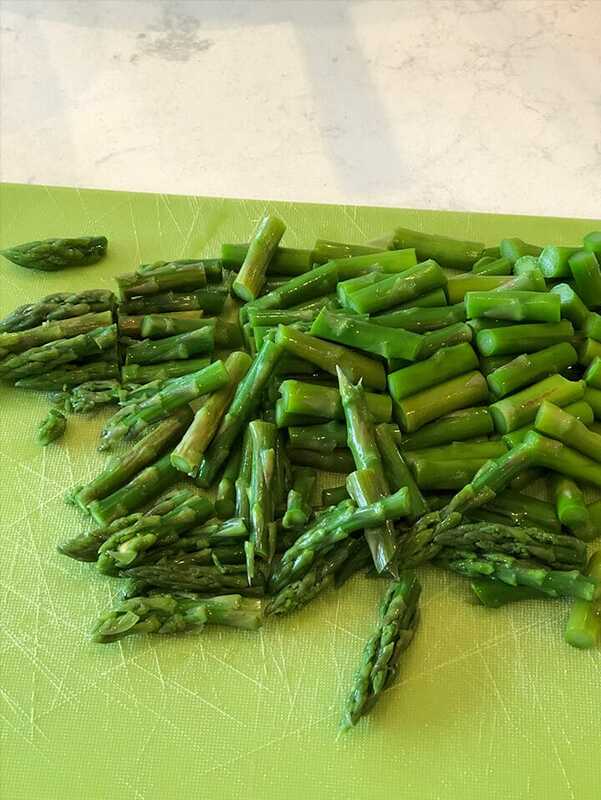 Blanch asparagus for 40-45 seconds. Remove immediately and plunge into ice water, then drain on paper towels. Chop cooled asparagus into one inch pieces and add to pasta. Add drained artichoke hearts, sundried tomatoes, and peppers to pasta. Add dressing and stir gently until well mixed. 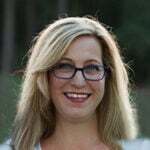 Update Notes: This post was originally published May 28, 2011, and on March 4, 2019, was updated with one or more of the following: step-by-step photos, video, updated recipe, new tips. Need more help? Check out these 5 Mistakes to Avoid When Making Pasta Salad! Ok I’m confused about the amount of lemon. Says 1 lemon zested & juiced (save juice) and below that ANOTHER 1/2 lemon Juiced. Since I’m NOT seeing anywhere to “use the ‘saved’ juice elsewhere in the recipe, I’m thinking maybe that 2nd part meant to say 1/2 the above saved juice? So that the dressing has Zest of a WHOLE lemon but juice of 1/2 lemon or is it juice of 1 AND 1/2 lemons? You should use the juice from 1 and 1/2 lemons and the zest from 1 lemon. Sorry if it is confusing. I will edit the recipe to see if I can make it clearer. Hope you enjoy the pasta salad…it is delicious! ‘So glad you posted the recipe! When I saw the shower post, which was lovely, I was trying to figure out the combination to create this salad. Oh my gosh, you have to try this! It is so good. Do you have a Costco near you? I don’t have enough basil yet, so I use their pesto and it is wonderful. Hope you enjoy and have a great Memorial Day!